The small Gulf Coast community of Mexico Beach was known as a slice of Old Florida. Now it lies in splinters. 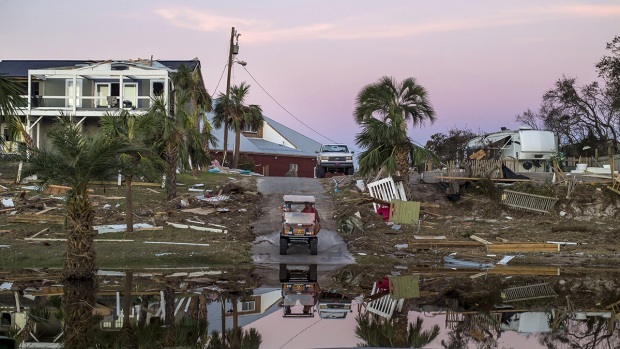 Hit head-on by Hurricane Michael, homes in this town of about 1,190 people were shattered or ripped from their foundations. Boats were tossed like toys. The streets closest to the water looked as if a bomb had gone off. 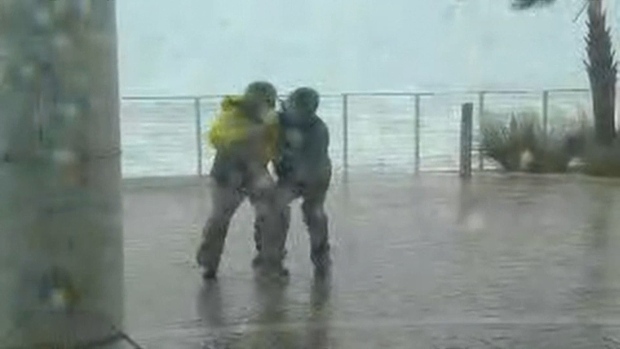 What the 9-foot storm surge didn't destroy, the 155 mph winds finished off. Now, rescuers and residents are struggling to get into the ground-zero town to assess the damage and search for the hundreds of people believed to have stayed behind. Mishelle McPherson and her ex-husband looked for the elderly mother of a friend on Thursday. The woman lived in a small cinderblock house about 150 yards from the Gulf and thought she would be OK. Her home was reduced to crumbled cinderblocks and pieces of floor tile. "Aggy! Aggy!" McPherson yelled. The only sound that came back was the echo from the half-demolished building and the pounding of the surf. "Do you think her body would be here? Do you think it would have floated away?" she asked. As she walked down the street, McPherson pointed out pieces of what had been the woman's house: "That's the blade from her ceiling fan. That's her floor tile." 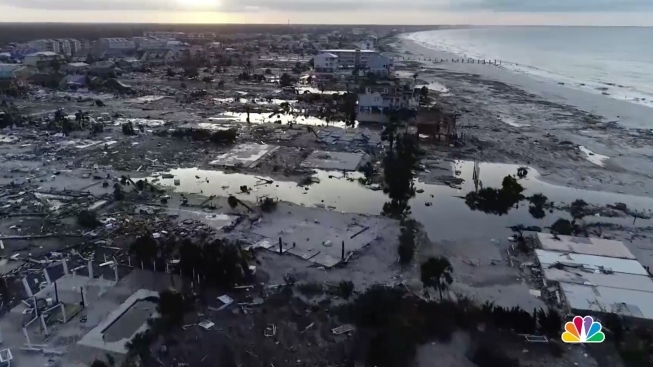 Drone footage of Mexico Beach on Thursday morning showed a stunning landscape of devastation. Few structures were unscathed. John Humphress, a storm chaser and drone pilot, arrived in Mexico Beach around 5 p.m. Wednesday, a few hours after Michael slammed into the coastline. He had one word to describe what he saw: "Apocalyptic." State officials said 285 people in Mexico Beach had refused to leave ahead of the hurricane despite a mandatory evacuation order. A National Guard team went into the area and found 20 survivors overnight, and more crews were pushing into the area on Thursday. The fate of many other residents was unknown, authorities said. Humphress, who spent the night in his truck on a bridge near Mexico Beach, said he didn't see anyone dead. On Thursday, residents who evacuated tried to return. The Rev. Eddie LaFountain, pastor at First Baptist Church in Mexico Beach, was one of them. He described the place as a "good family resort town" that attracts visitors seeking peace and quiet rather than the spring break-like atmosphere of other communities along the 200-mile Florida Panhandle. Most of the full-time residents, he said, have some connection to the hospitality industry. Some operate vacation home rentals, while others work jobs cleaning and maintaining the homes. Others own or work in restaurants, rent out kayaks or operate charter fishing boats. LaFountain himself has a lawn-mowing business. Despite the widespread destruction, LaFountain said he believes most people will rebuild. "I think the people here have a great heart and a lot of resilience. We call them stubborn and hard-headed. I think they will be back," LaFountain said in a phone interview while driving back to Mexico Beach. A Florida hurricane expert said the footage of buildings in Mexico Beach stripped to their concrete foundations was no surprise. "This is what we expect with storm surge and high wind events," said Craig Fugate, former director of the Federal Emergency Management Agency and a former emergency management chief for the state of Florida. Florida has some of the most stringent hurricane building codes in the country, but they apply only to new or retrofitted structures. Mexico Beach is on the west end of what's called Florida's Forgotten Coast, so named because it is not heavily developed like many of the state's other shoreline areas, with their lavish homes and high-rise condos and hotels. U.S. Route 98 runs right along the coast, where a few beachside restaurants offer oysters and other seafood, cocktails and a view of the Gulf of Mexico. Other communities along the Forgotten Coast include Port St. Joe, Apalachicola, Eastpoint, St. Marks and St. George Island, all places where folks from nearby Tallahassee, Georgia and Alabama like to escape for quiet weekends. As Republican Sen. Marco Rubio tweeted: "Mexico Beach is an old old #Florida town. It's charm is that it feels like a trip back in time to a place unspoiled by development. I was told this morning that is is 'gone.'"